Catch and quickly absorb unwanted splashes and drips under urinals that cause cross-contamination, odors, and damage with Urinal Mat HD Absorbent with Grip Backing. This super absorbent mat is constructed of layers of nonwoven fabrics that are laminated together with a layer of moisture barrier plastic film. Its thin, 0.115" thick construction with grip backing, helps prevent tripping and slipping. The mat is soft and flexible, conforming to any flat surface. Neutral gray color mat is 18.12" x 20.5" x 0.115" thick. Urinal mat can last up to 4 weeks, depending on traffic, and is easy to dispose. 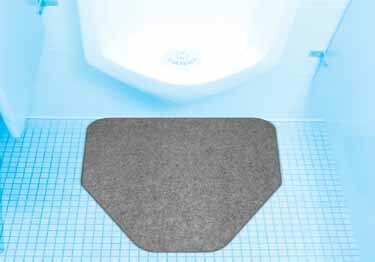 Catch and quickly absorb unwanted splashes and drips under urinals that cause cross-contamination, odors, and damage with Urinal Mat HD Absorbent with Grip Backing. This super absorbent mat is constructed of layers of nonwoven fabrics that are laminated together with a layer of moisture barrier plastic film.